Manor, in all of its various guises made its Formula 1 debut as one of Sir maXXum's (Max Mosley) chosen suitors, all powered by the ubiquitous "Cossie" (Cosworth) V-8 customer 'lumps, i.e. ; (Campos) Hispania, Lotus F1 Racing, Manor and USF1 and is the only surviving entity from these four entrants. The team garnered much initial fanfare as Virgin Racing due to Sir Richard Branson's sponsorship before Marussia first sponsored the team and then ultimately bought it before filing for bankruptcy after last year's Russian Grand Prix., on the heels of team darling Jules Bianchi's horrendous accident at Suzuka. Thus, having gone into Administration, with a two-day auction set to sell off their wares, the team effectively sold its Banbury F1 Headquarters to rival Haas F1 before cancelling said auction and is now working out of the original Manor facilities in Dinnington. According to Adam Cooper, who's led me on somewhat of a wild Goose chase over what the team's name would be rebranded as prior to season's beginning, past word proclaims that it'll always be Manor Grand Prix Racing Ltd, but will run under the moniker of Manor Marussia F1 Team, most notably since the chassis must reflect the team's name, which the last F1 chassis was the MR03. Not sure why all the hubbub over Will Stevens needing an FIA Superlicense pre Melbourne, since after all, the 23yr old Briton needed one when making his debut for Caterham's final appearance in F1 at Abu Dhabi. Whilst my initial guess (A few months ago, Pre Melbourne) for Stevens team-mate was 2014 Formula Renault 3.5 Front-runner Roberto Merhi, who thought he had a drive at Caterham for the season finale last year. As the team indeed did subsequently signed the aspiring 23yr old Spaniard Merhi to its second seat, who'd also done testing duty for the defunct Caterham team last year, albeit Merhi seems to be a "Stop-gap" measure at best, since reportedly his deal is only for the season's opening rounds. Manor mistakes in Australia to cause team further Headaches? As thankfully, the F1 team that's quickly become my favourite this season managed not only to show up in 'KL, (Kuala Lumpur) but effectively take to the track, albeit F1 Debutee' Roberto Merhi garnered "Facetime" the wrong way by spinning off and bringing out a Red flag during the FP2 (Free Practice) session, whilst the NBCSN Booth Boyz, "Professor" (Steve) Matchett Me Thinks? 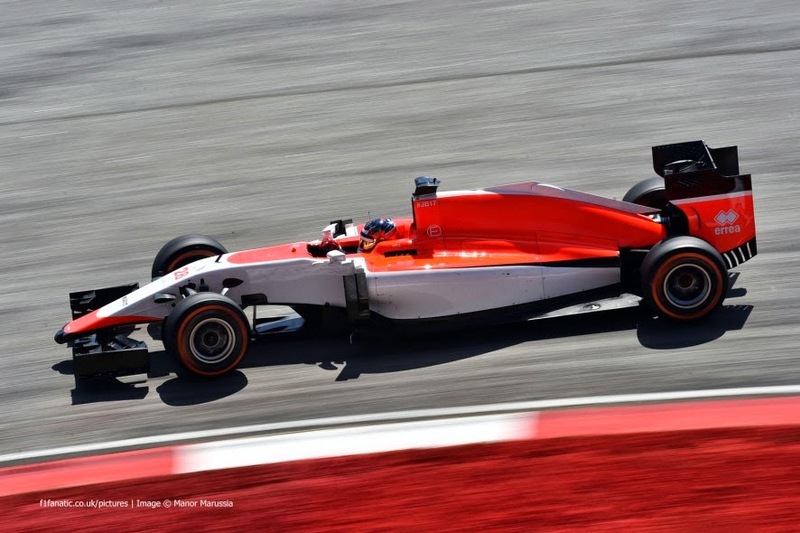 Mused over how barren the Manor-Marussia's flanks looked in regards to relative lack 'O sponsors; YIKES! And adding insult to injury was the fact that Will Stevens was unable to start in Malaysia due to an unfixable Fuel Supply issue. As these teething issues will continue being worked out over race weekend's due to their total lack of any Pre-season testing! Rossi Operates on Marquez in Argentina! Will Pedrosa race in Austin? MOTO GP: Can Marc Marquez "Three-Peat?" INDYCAR: When Bad Racing turns Ugly!